TRAIN! Get off my Tracks! Kilsin posted a fun question to the Pantheon forums which I am sure will generate some interesting responses. Head on over to the official Pantheon MMO forums and give us your two coppers worth of wisdom. Scenario: You accidentally aggro a room full of mobs in an outdoor area, your first reaction is to run but there is a small group of players waiting patiently for a member to catch up to them in the pathway of the only exit - What do you do? My first thoughts of trains leap to Unrest. The trains were a fun (and often frightening) thing to behold. Blackburrow had some sweet trains too. Kilsin's weekly community question was about crafting in MMORPG's and specifically, what you want to see in Pantheon. Crafting - How much do you like crafting in MMORPGs, is crafting something you expect to be in-game and how important do you think it is for the game even if you don't craft? As always, these questions generate some well thought out posts by the Pantheon players. Head on over and weigh in on what your expectations and hopes are around crafting in Pantheon. Some people love crafting while others hate it but everyone expects it to be in game. Speaking of Crafting, if it's something you feel passionate about, in addition to weighing in on the official discussion thread, make sure you hit up the Pantheon Crafter's forums. Pre-Alpha testing is currently underway for those who are lucky to be able to participate. The servers will be up for character creation and some initial adventuring. While you can no longer pledge to participate in the Pre-Alpha, you can still (and should) pledge to help the game's development out and get some in-game items as well. Our team is deep into the final stages of preparation for the next round of Pre-Alpha testing as I write this, and will be opening the servers for initial character creation on the day this newsletter is published, so this a truly exciting time for all of us here. We know our internal excitement is easily matched by that of the community, because your feedback, support and words of encouragement are the fuel that keeps us running every day. There are a few key parts of Pantheon I’ve been working on since joining the team in November. The first is tooling; I’ve spent a lot of my time working on building tools for the game-design team to create the content you see in-game - in fact, for the last few days, I’ve been working on a new dialog editor so our quest designers can create interesting dialogues and conversations easily. In another installment of the Rogues Gallery, we get to learn details about the Giants of Terminus! 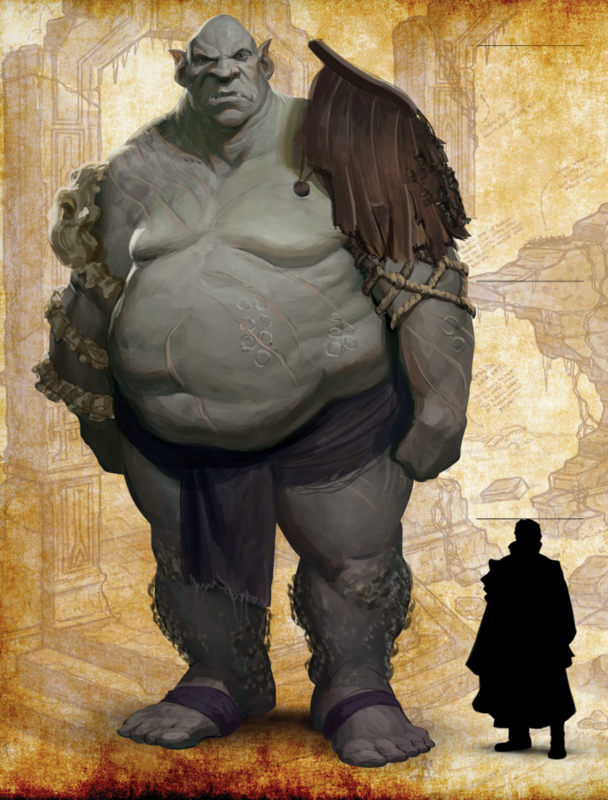 I recall back in my Everquest days, how much I feared the Hill Giants who liked to stomp about the lands and the horror I felt while meditating in West Karana (when the screen was fully obscured by your spell book) and I suddenly heard the crashing sounds of an approaching giant (often resulting in my squishy demise). It's a great read, full of the backstory of these massive beings who no doubt will ruin many an adventurer's day! Lastly, Chris 'Joppa' Perkins gives us some behind the scenes in the latest installment of 'Underwraps'. He discusses some of his experiences around the design of healer classes (Cleric, Druid and Shaman). Also of interest is mention of the next three class reveals (Wizard, Enchanter and Summoner which will be discussed in August!) and hints about future details around the Necromancer and Bard. (Personally, I am very excited about Enchanters as it was my main class on EQ for years.. along with my monk). We also get to see a little bit of what goes into the world building process using what he calls draw-overs. The process is rather simple: we meet internally to discuss the overall vision for a zone - what NPCs will you encounter here? What are the points of interest? How should this zone feel to the player - what kind of mood? What do we want the player’s experience to be like as they explore this zone? We work through all of these design and philosophical paradigms together. Before and After showing the draw-over planning.. There's also an early look at some Orc-themed architecture which Jerry Kuklis recently finished. I can't wait to do battle here! I can already imagine the pulls and and hear the sounds of battle as we lay siege to the Orc outpost. Lastly, a quick summary of how the player character models are coming along. They are looking pretty great and I can't wait to see them running around the lands of Terminus! 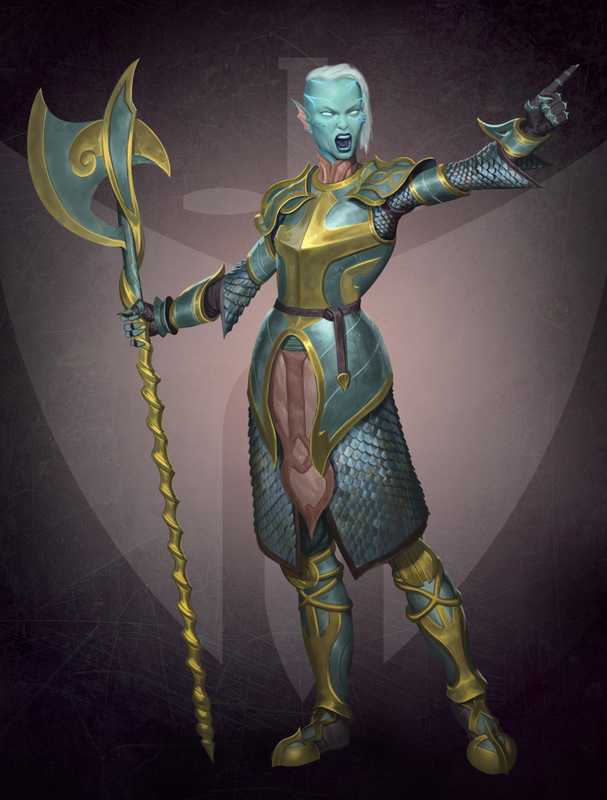 We have finished the modeling and texturing process for 6 of the 9 playable Races Pantheon will launch with, including the male and female variations of each. Here is the current list of finished models: the Humans, the Halflings, the Elves (both Ember and Ashen variations), the Dwarves, the Gnomes and the Ogres - exciting indeed! More class reveals are here! In this month's Newsletter we get to learn about three more of the beloved classes which make MMORPG's such fun. Details are shared about the Dire Lord, Paladin (which was the class of my first character created in Everquest) and the Warrior! The newest member of the design team, Jimmy Lane, provides us with a glimpse into the world design via a Q&A session. We have several initiation rituals here at Visionary Realms for our new team members, and while we can’t divulge most of them publicly, one of our favorites is sending our Producer of Promotional Content: David Schlow out for a quick interview. This month, David sits down with the newest member of our team, Jimmy Lane who joins us as one of our World Builders. Lastly a new section of the newsletter "Under wraps" makes its debut. It covers numerous points of interest which many will enjoy reading. Class design, a new zone: Faerhale, Pre-Alpha 3 and a visit with our favorite rodent, The Ratkin round out this section. Definitely head over and give it a read! The May Newsletter was posted on the 16th and it packs some great details about three classes including one of my favorites, the Monk! The other two classes covered are the Rogue and Ranger, both classes which I know are dear to many old fellow Everquest players out there. 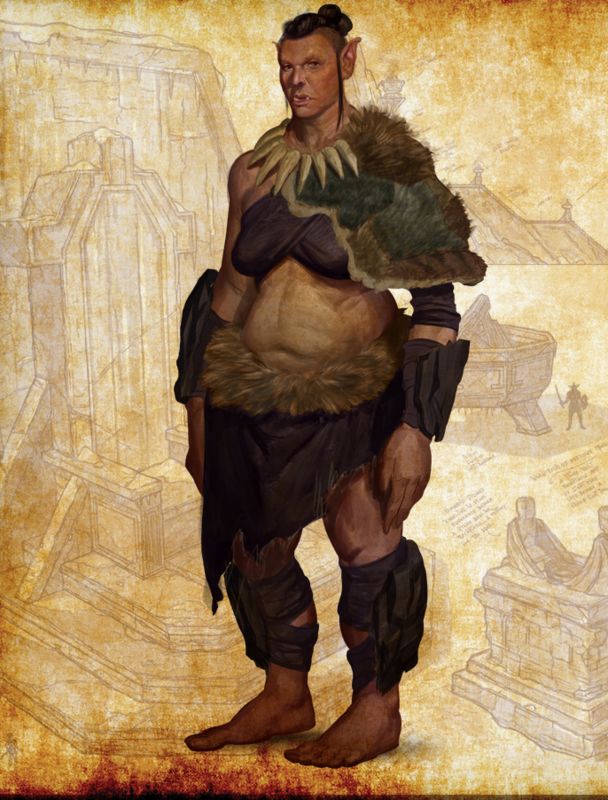 Also covered are one of the other inhabitants of Terminus, The North Tusk Orcs. Orcs tribes cover multiple continents throughout Terminus, each with relatively independent agenda, tendencies and of varying size. Yet binding these tribes together is an ancient accord known as the Bloodsworn Covenant, which was founded before any of the Sacred Six came to Terminus. Lastly, the PAX East highlights wraps up the news which also includes a video. It was an experience filled with connecting face-to-face with “old” friends and fans, as well as meeting tons of new friends too. That alone was worth the trip, but being able to watch people in-person play the game we’ve all been working so hard on was sort of a surreal experience. And, to see that they enjoyed it! Well, it has stoked our fires more than ever. Developers from the Visionary Realms team share their favorite part of showcasing Pantheon: Rise of the Fallen at PAX East 2018. Follow me for more Pantheon coverage! The Black Rose Keep is once again in the sights of some early adventurers. We will be treated to two consecutive nights of streams as players explore the depths of The Black Rose Keep! Tune in Thursday, April 26 at 8 PM EDT and join Koopatroopa787's Twitch Stream and watch the action from a Shaman's perspective. Then on Friday, April 27, at 7 PM EDT make sure you hop on to The HiveLeader's Twitch Stream for some more dungeon crawling goodness as he plays a Cleric! Update April 27 2018: If you missed Thursday's stream, here it is. Update April 29 2018: If you missed Friday's stream, here it is. Stream of Black Rose Keep! Mark it in your calendar! There will be a stream of gameplay in the zone Black Rose Keep on Thursday, April 19 at 8 PM EDT. Hop on to watch it at either twitch.tv/lassiz or twitch.tv/visionaryrealms. Once links to the stream are available for viewing afterwards, we will post them here.. It has been an amazing month so far! April brought us some great new information from PAX East and the cherry on the top is the April News Letter. We are treated to three features this month! Starting off is a new series titled the Rogues' Gallery which shines the spotlight on various Terminus inhabitants. This month we get a look at The Ratkin. Ratkin are one of the more ubiquitous races in the Western Hemisphere of Terminus. Nearly every continent has at least one colony, from Kinsgreach down to Whitethaw, with several having multiple colonies in multiple regions. As diverse as environments are, so are the types of Ratkin that inhabit them. We next get to hear from one Daniel Krenin in the Dev Spotlight. It's always fascinating to hear from the devs to lear their background, what makes them tick and how intense their focus is on making Pantheon the best. The scope of my work is quite broad. I've touched every major and minor system in Pantheon, and I'm not sure I can fairly quantify how much of the code I've written..
As well as being the lead programmer, I've been a key member of the the design team since I started. We're always in discussions, and working through new systems together..
Last and most excitingly, we get a lot of detail about a zone named Black Rose Keep! There's so much to read about the background and design. Grab a drink and enjoy the great writeup! We excitedly unveiled our newest iteration of Black Rose Keep, a level spanning zone that begs to be explored, at PAX East this month - and the feedback was incredible. To celebrate the PAX East event, a new pledge level was added from April 03 to May 01, the "PAX East 2018 Pledge" This gives you all of the benefits of the SunHunter's pledge PLUS Pre-Alpha access. If you pledged at a lower level, you can upgrade your pledge (NOTE: to upgrade an existing pledge level, you need to open a support ticket.). This is a great opportunity for those who missed out on pledging at an appropriate level last year, to get in on the Pre-Alpha efforts PLUS, you will be helping to fund this amazing game! You can catch Jim Lee's stream of his game play on YouTube. It was a great thing to watch! Jim Lee has an appreciation for challenging, socially charged MMORPGs. Join him and the team on his journey through Pantheon Pre-Alpha. Despite a few pre-alpha bugs at the start, the group takes a quick look at Thronefast before heading to Halnir Cave to do some exploring and combat, ending in a crazy boss fight that's not to be missed. We get a great treat this week! (make that two!) A stream of gameplay in Halnir Cave has been posted. Watching this really gets me excited to get in the game to give it a shot! Oh yes, I mentioned TWO streams didn't I? Well, the second stream will be happening March 20 at 11 PM EDT. You will be able to watch it live HERE. Once a copy is available to watch, I will post a link here on the Pantheon News site. The March Newsletter has been published and it was well worth the wait! We get a chance to learn some details about a very important part of our characters, the armor they wear. First up, we've tracked down the elusive Joppa and our amazing Character Artist, Will Barry to give us the scoop on the process behind the virtual forging of armor in Pantheon. They discuss both the design aesthetics and the underlying mechanics that go into this crucial process. Next, we strap some of the aforementioned armor on and delve deep into one of the first dungeons that will be available to many players in Pantheon, Halnir Cave. 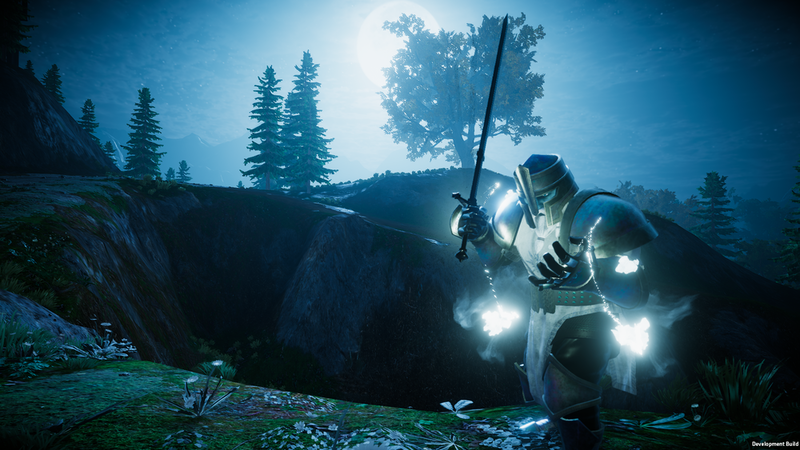 Our Pre-Alpha testers got their first taste of this zone recently, and the response was so overwhelming that our Lead Writer Justin Gerhart and Associate Designer Tim Wathen couldn't wait to spill the beans on the process behind creating that experience. Make sure you tune into listen to The Voices of Terminus stream on March 5 at 6 PM EST to listen to their interview with Pantheon developers Tod Curtis and Ben "Kilsin" Walters. You never know what new details will emerge from these interview so they are well worth listening to! Bazgrim scored a chance to interview Visionary Realms' Senior Game Designer Corey "Ceythos" LeFever. It's a great interview and well worth checking out! As always, hearing about the thought and effort which these guys put into the game is inspiring. February's Newsletter is live and ready for your viewing pleasure! Lead Game Designer and Creative Director; Chris "Joppa" Perkins provides us with the latest State of the Game. The big news for many is that Pre-Alpha has officially begun. 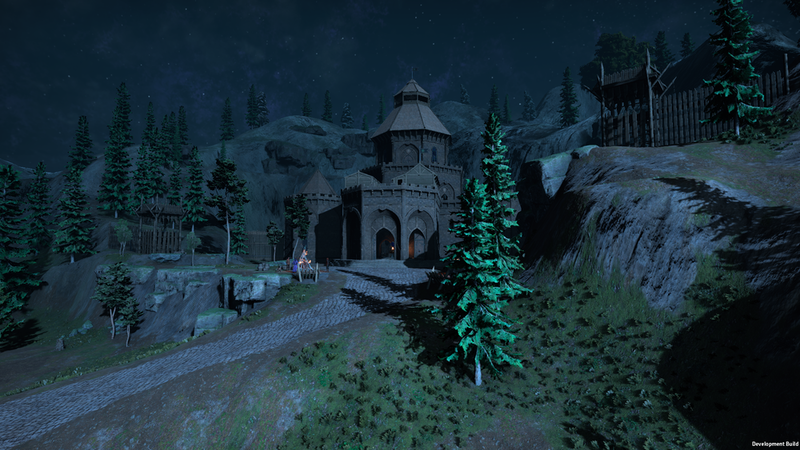 The Pre-Alpha players have been spending their time running around, leveling up, questing and most importantly, testing in the human capital zone of Thronefast. The Elves of Terminus also get a thorough discussion by the team which delves deeply into the creative design decisions behind the elusive race, their cultural icons and teases us with mention of the mountainous Elven city of Faerthale! Faerthale. I have dreamt more about that city than any of the other nine, and working through the environmental art has only made me more excited. I don't hope it only pleases me, I hope Faerthale is an intimate and iconic home for many, many people for a very long time. I hope the effort to consider details big and small creates a place that everyone can cherish, no matter how little of the story they care to know. If Faerthale speaks for itself, we've done our job of telling. I am once again blown away the intense focus on detail from this amazing group of talented designers. You can tell that these guys love what they do and are driven to make this the best game out there. I can't wait to see what next month's newsletter reveals! A great stream was posted to YouTube which takes us into a city under development. We get to view the massive city gates and also get the view the process which was used to build them.. from the initial concept art, through various refinement stages to the final full render. I'm constantly amazed to see how this is done and how no small detail is missed. 'll probably spend months of time just looking at small little details when the game is released! Also fascinating was getting a glimpse "under the kimono". 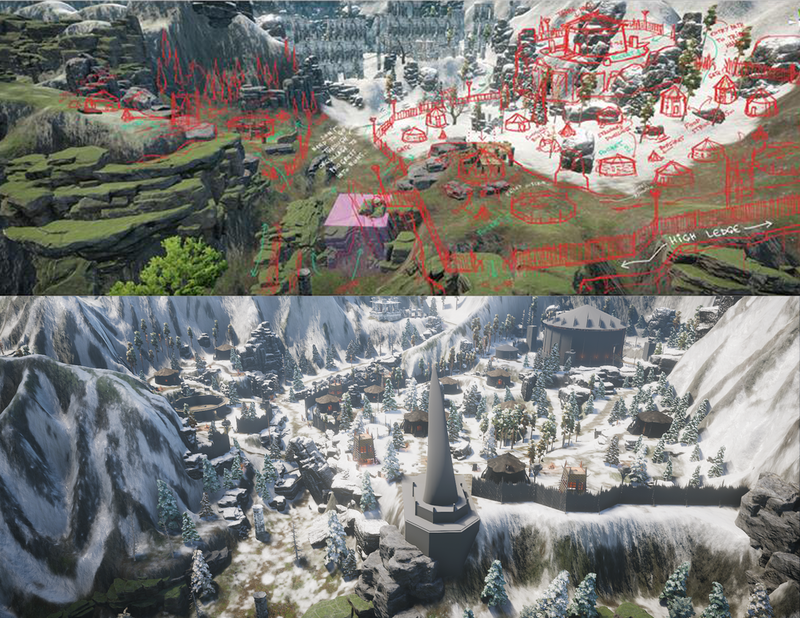 Inside of the massive city of Thronefast, we can see many buildings as well as what are placeholders of sorts through a process called "grey boxing". 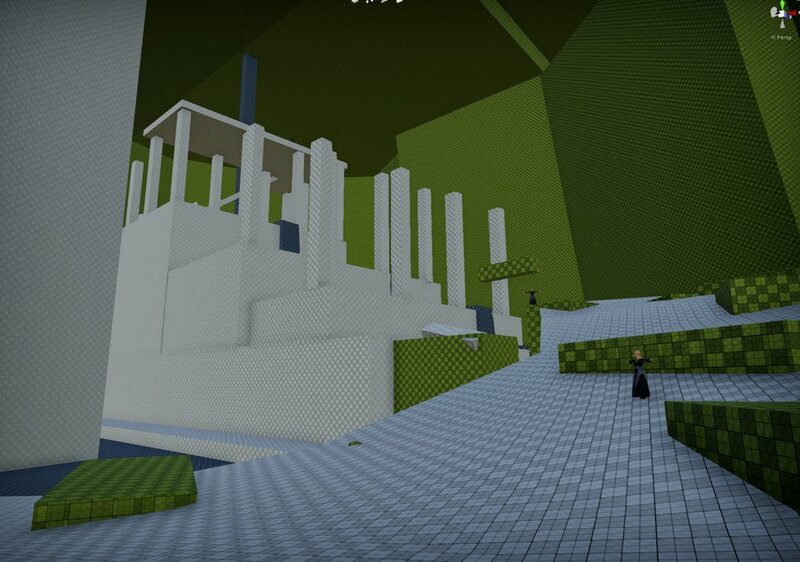 This is where in-game structures are roughed in using flat grey surfaces. This really helps the world builders calculate and adjust the scale of the different structures in relation to the other in game items like buildings, walls, decorative objects, etc. Once again, watching the time and effort which the team is putting into budding this world is simply amazing. Another great video to watch which gives us all a great look behind the scenes of Pantheon: Rise of the Fallen is The Technical Art of Pantheon: Rise of the Fallen. We start out in a wooded area where lighting and clip plane adjustments are covered. Next it's to the top of a tall tower near the human city of Thronefast. This allows a demonstration of the view distance and procedural cloud effects. Next it's time to head to the ground at an arch near the tower to learn more about the processes involved in adding details to objects (grunge, moss, etc) and tools created to help cut down on 'grunt' work. Now it's time to head near a lake to see how lighting, shadow distance and rendering works (using custom shadow programing helps improve performance). Why just look at the lake when you can go for a swim right? Custom coding on water and effects (sub-surface scattering) really look great (and this is in the early stages). Now it's time to hit some cool looking ruins with mist, background sounds and awesome looking skeletons on patrol! This demonstrates one of the environmental effects called 'gloom'. To wrap up the tour, a visit to a dungeon which was visited a while ago. The team showed off the significant lighting and environmental improvements made to an area around a bridge. Improved lighting effects. Increased intensity, details in shadows, ambient lighting effect. Procedural cloud generation looking great. Shadow effects significantly improved through in-house created coding. Custom code for subsurface scattering and water effects look great and will be rolled out to other surfaces such as grasses, trees, etc. It's the start of the new year and what better way to start it than with a new monthly newsletter? 2017 marked many milestones for us, not the least of which was the start of the long awaited Pre-Alpha testing phase. We also had our first live gameplay demonstration at TwitchCon, increased our number of live streams with our friend CohhCarnage, closed our Series A funding, expanded our team and reached increased levels of exposure thanks to many opportunities and the never ending support of our fans. Key members of the team weigh in on what they felt were high points of 2017 around Pantheon: Rise of the Fallen's development. Something near and dear to my heart was revealed by Benjamin Dean. 20 years ago, in 1997, GDC was held at the Long Beach Convention Center. It was at that GDC that EverQuest was first shown publicly. Brad recounted the story to me on how they suspected they had a good game but it was only at GDC when they *knew* they had something special, based on fan reaction. How appropriate that 20 years later, at the same venue, Pantheon makes its public debut. And the reaction was more than we had hoped for. It was a real thrill!